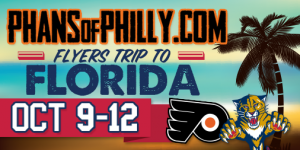 First, we just want to say this is going to be the BIGGEST Flyers road trip we have ever done! Montreal was our biggest road trip last year with 200 Flyers fans, and we are looking to add to that number! We will also be teaming up with the Philadelphia Flyers Fan Club on this one to add to our numbers! We are flying down a large group of Flyers fans, and we have a HUGE number of Philly transplants who will be joining forces with us while we are there!! It is going to be an all out takeover of ORANGE & BLACK at the Panthers home opener!! We fly out Friday morning October 9th with great non-stop flight times that gets you into Fort Lauderdale by early afternoon to enjoy the whole day. Our flight will be FLYERED up because we are all flying together on one plane! Once we arrive in Fort Lauderdale we will provide transportation for everyone to our awesome downtown BEACH FRONT hotel B Ocean Resort. Their rooms are $300 a night that weekend, but we worked out an awesome rate for our group to be able to stay there! The hotel is in the middle of all of the action walking distance to all of the bars, entertainment, restaurants, and shopping! It is 1 of only 2 hotels in Fort Lauderdale that has direct access to the beach! In fact it has its own private beach! They have a beautiful pool, and the pool bar is pretty awesome (Check it out!) Each room gets 2 FREE drinks at the bar during your stay. The hotel is also going through a renovation that will make this place even better before we arrive! There is a water taxi stop 2 blocks away, and we have special group coupons that gets you a discounted rate to travel anywhere further by water! There is also a trolley car that drives up and down the strip for $1! You don’t have to worry about anything, as this hotel is in the perfect location! Friday night we will be hosting a pep-rally party to get amped up before everyone heads out for the night. It is a fun way to get everyone together to get to know everyone on the trip. Our friends at the Parrot Lounge which is a short distance from from our hotel will be taking care of us! The owner is from Philly, and he is super excited about this party! He will be laying an assortment of food out for our group, and giving us awesome drink specials. $15 buckets of beer and $4 mixed vodka drinks! They are even offering a MEGA bucket of beers with 15 beers for $40. Can’t beat that! We will also be giving away Flyers jerseys, Flyers home game tickets, Flyers memorabilia, AND a few spots to watch warm-ups from the Flyers bench before the game on our trip! It is going to be a fun get together to get everyone’s night started! Saturday is game day! We will have deluxe motor coach buses transporting us the 20 minutes to and from the game. At 5:00 PM we will kick off the best pre-game party we have ever planned. Our party will be held in the Panthers arena in their Sky Club! It includes all of your food, beer, soda, wine, and music entertainment! Better yet this runs through the whole entire game! You don’t have to spend a penny at the game! Our upper level seats are located all together in this Sky Club giving you easy access to take full advantage of the deal all game! We will be sure to take over the arena with loud LET’S GO FLYERS chants! We also worked out some REALLY cool fan experiences for our group. A few lucky members of our group will be able to watch warm-ups from the Flyers bench. Also, after the Flyers beat the Panthers our WHOLE group will be escorted onto the ice for a big group picture at mid-ice on the Panthers logo! This is a once in a lifetime experience to get a group of Flyers fans on an opposing teams ice to take a picture together! It is going to be one awesome picture! Our buses will then take us back to Fort Lauderdale for the night. We found in the past that staying an extra day on Sunday has worked well, and people enjoyed having the extra time. So we are staying Sunday night as well! The Eagles play the Saints at 1:00 PM that day. Once again our friends at the Parrot will be taking care of our group to have an Eagles watch party. The owner told me it is like watching a game in Philly on Sundays. There are 300+ Eagles fans living in Florida who come to the bar to cheer on the Eagles every Sunday. This is going to be a pretty awesome Eagles watch party in Florida. After a long weekend we will fly back to Philadelphia on Monday. We will have airport transportation from our hotel to the airport for everyone. You don’t want to miss out on this trip! Roundtrip non-stop airfare as a group departing Philadelphia Friday October 9th and returning Monday October 12th. Transportation to and from Fort Lauderdale and the game. The bus drivers gratuity is also included. Giveaways that will include Flyers jerseys, Flyers home game tickets, Flyers memorabilia, and a chance to watch warm-ups on the Flyers bench before the game on the trip! Specials on cover charges, drinks, and food at several downtown bars and restaurants for our group. Special coupon for discounted water taxi tickets that will take you up and down Fort Lauderdale by water!